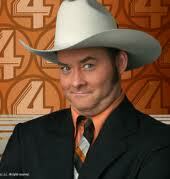 Stay Classy with Orville Johnson! We just can’t get enough of our favorite slider, Orville Johnson. Here he is with Jason’s “Champ” style pickup (from our custom shop) and a vintage Tweed amp, pulling some sweet tones and tasty licks. This is the fourth article in a series about best selling Lollar pickups. In this post we will talk a little about best selling Lollar Imperial® humbuckers, plus give you an overview of the three full sized, stock humbucking pickups that we build. For this discussion we’ll stick to our full sized humbuckers only. We build three general categories of Lollar Imperial® humbuckers. They are categorized based on their output levels, using the standard wind Imperial as the “baseline” or point of reference. The three categories are the Lollar Imperial (considered our standard wind), the Low Wind Imperial, and the High Wind Imperial. As the name implies, the Lollar Low Wind Imperial is a slightly lower output pickup as compared to our standard wind Imperial. Our High Wind Imperial is a slightly higher output pickup as compared to our standard wind Imperial. For detailed descriptions and sound clips of the three different full sized humbuckers we build, follow this link to read about Lollar Imperial® humbuckers. On a side note, this is a good opportunity to clarify the word “wind” as used in the names Low Wind and High Wind. This word refers to the amount of copper wire that is wrapped – or wound – around the humbucker bobbins to form a “coil.” The wire is wrapped around and around the bobbin, literally thousands of times to make each coil. The number of times the wire is wrapped around the bobbin is called the “turn count.” The turn count is the number of times the copper wire is “wound” around the bobbin. The term Low Wind refers to the fact that there are fewer times the copper wire is wound around the bobbin to make a coil. The term High Wind refers to the fact that there are more times the copper wire is wound around the bobbin to make a coil. A favorite: standard Lollar Imperial humbuckers, with nickel covers and traditional single conductor leads. Getting back to best selling Lollar humbuckers: Our standard Lollar Imperial is our best selling humbucker – by far. We sell roughly 50% more Lollar standard Imperials than Low Wind and High Wind Imperials combined. Each of our humbucker models is available in eight different “finishes.” These include nickel, chrome, gold, aged, heavy aged, double-black, zebra, and reverse zebra. In addition, each of these is available in your choice of either the traditional Gibson style single conductor lead wire or 4-conductor lead wire. So in other words, you have 16 different choices of standard Lollar Imperial sets to choose from. Among all of these choices, our nickel covered single conductor Lollar Imperial sets are the top sellers. The second most popular Imperials are (again) our nickel covered Imperial sets, but with 4-conductor leads. Our third best selling full sized humbucker is our Low Wind Imperial neck, with nickel cover and single conductor lead wire. This item is popular for two reasons. First, our Low Wind nickel single conductor sets are popular with archtop players. Second, our Low Wind nickel single conductor necks are great for tele applications. The Low Wind Imperial neck (usually nickel, single conductor) is frequently combined with the Lollar Special Tele bridge. Now, like we have mentioned throughout this series, there really is no “wrong” answer. All of our pickups have their own advantages. The best approach is to know what your specific goals are, and then make your selection based on what you’d like to accomplish for the particular project or guitar you are working on. Next week’s discussion will be about a few other popular “miscellaneous” items. This article is third in a series of discussions about best selling Lollar pickups. This session will feature our best selling Lollar P-90 style pickups. The Lollar P-90 is really the “flagship” Lollar pickup, and is often considered “the” pickup that began to draw customers’ attention to Lollar pickups. Lollar P90 soapbar sets are a strong favorite. 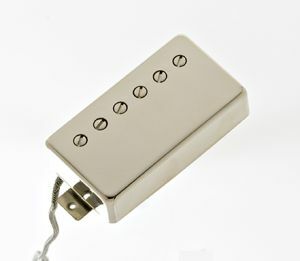 Our best selling P-90 is the standard wind soapbar style pickup. In fact, we sell over twice as many of this particular model of P-90 than all of our other p-90 pickups combined. That includes all of the other soapbar and dogear models that make up our entire list of P-90 stock models. Many of the builders we work with install the Lollar standard wind P-90 soapbar sets. Some of these builders include Collings, Godin, Heritage, and National Resophonic. In fact, as an historical tidbit, it was National Resophonic that was the first established guitar builder that purchased a small run of Lollar P-90 soapbar pickups for use in one of their electric instruments. Since that original purchase in 2002, the Lollar P-90 soapbar has continued to be original equipment on the National Resophonic “Resoelectric” guitar. For more specific information on our standard P-90 follow this link to Lollar P-90 pickups. And, as we’ve mentioned before, there is really no “wrong” answer when making your individual pickup choice. 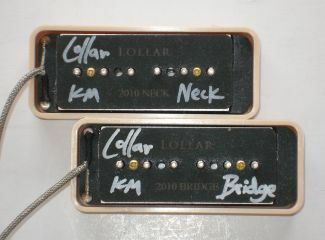 Each model of Lollar pickups has its own unique advantages. Our best advice is to decide what you’d like to accomplish for the specific project or instrument you are working on, and then base your decision on what’s right for you. Next week’s discussion about best selling Lollar pickups will focus on best selling Lollar humbuckers. So we thought it made sense to share that with you. For the next few blog postings we will talk a little about some of our top selling pickups. 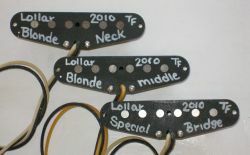 We will start with the Lollar strat style pickups. 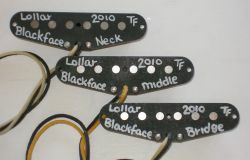 The Lollar Vintage Blackface® pickups for strat are our most popular stock strat pickup. Many players find the Blackface set to be one of our most versatile. Clear and articulate when played clean, while at the same time offering a warmth and punchyness that make the Lollar Blackface set a favorite. We call this combination the Lollar "Dirty Blonde" strat style set. It is also very popular. Another top selling Lollar stock strat set is a combination set we refer to as our “Dirty Blonde” set. The Lollar Dirty Blonde strat set is a mixture of Lollar Vintage Blonde® strat pickups in the neck and the middle positions, and the Lollar Special S Series® strat pickup in the bridge position. This combination gives many players the “best of both worlds.” The Lollar Vintage Blonde® neck and middle offer a bit more sparkle, chime, and top end bloom. At the same time, the slightly higher output Lollar Special S Series® bridge is just a bit darker and rounder that our other strat style bridges. In most cases this helps lessen that typical strat “ice pick” bridge sound. The Lollar Dirty Blonde strat set is interesting for yet another reason: Nash Guitars. Basically, if you wanted to order what you hear in a Nash strat, you would want to order a Lollar Dirty Blonde strat set. For more detail on the Nash strat set, take a look at this previous Lollar Blog posting about Lollar pickups and Nash guitars. One last point to make about best-selling Lollar strat pickups: flat pole versus staggered pole pieces. When customers ask for our recommendation we strongly recommend flat pole pieces. For more detail on why we recommend the flat poles, follow this link to read an article about flat-pole versus staggered-pole pickups. Generally speaking, about 10% of the strats we sell are staggered pole sets. In other words, about 90% of the time our customers prefer flat pole strat pickups. Next week we’ll talk about best selling Lollar Tele style pickups.